Two men are assisting with police investigations after videos showing a car driver asking Prime Minister Lee Hsien Loong's son inappropriate questions while giving him a ride were posted on social media. In the videos, a 31-year-old Singaporean man had offered and given Mr Li Yipeng a ride in his private car. He can then be heard repeatedly asking Mr Li to confirm his identity, his residential address and the security arrangements for him. The videos started circulating on social media over the weekend, along with a screenshot of a Facebook posting purportedly made by PM Lee about the incident. 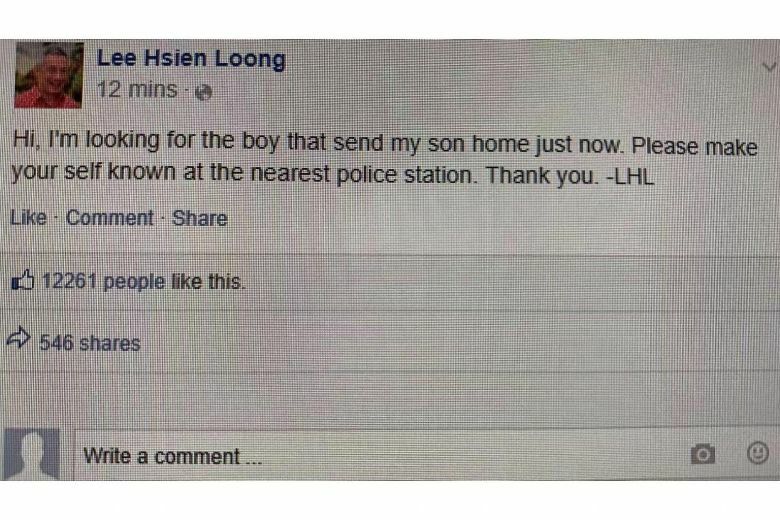 A photo showing a Facebook post purportedly made by PM Lee Hsien Loong about the incident was circulating online, such as on Facebook and Telegram. On March 17, 2019, police said that the post is fake and they are investigating the matter. In response to media queries, the police confirm that a report has been lodged regarding the videos, which were taken without Mr Li's knowledge or permission. "The police are looking into the matter with the assistance of the driver because the nature of the questions raises serious security concerns, given Mr Li's background," said the authorities in a statement on Sunday (March 17). "The 31-year-old man was convicted of taking a vehicle without the owner's consent under the Road Traffic Act and an offence of driving without a valid insurance under the Road Traffic Act was taken into consideration during sentencing in 2014." Separately, it is understood that the man was given a warning by the police for his involvement in a theft-in-dwelling case. There was also a police report lodged against him for criminal intimidation. The police are also investigating the circulation of the screenshot, which has been established to be fake. A 39-year-old man is assisting the police in this investigation.